TS PGECET 2018 (तेलंगाना पोस्ट ग्रेजुएट इंजीनियरिंग कॉमन एंट्रेंस टेस्ट): The University College of Engineering and Osmania University conducts Telangana Post Graduate Engineering Common Entrance Test on behalf of Telangana State Council of Higher Education. It is conducted for the admissions in various regular PG courses like M.Tech, ME M.Arch, M.Pharmacy etc. The admissions in Pharm.D is also provided through this exam. The interested students can apply for the TS PGECET Online Application Form 2018 before the deadline of the form. The dates for the exams are not announced yet. But they will be revealed after the publishing off the-the TS PGECET 2018 Notification. The students seeking admissions in various govt and non-govt colleges in the state of Telangana, they have to complete the TS PGECET Registration before the due date. The dates are not announced yet but it is expected that the form will release in March and end in April month. 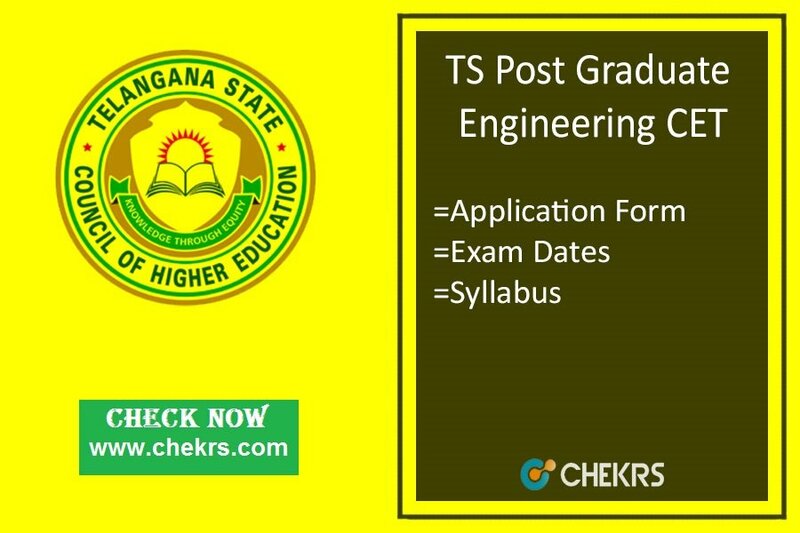 We will provide here the direct link through which you will be able to submit the Telangana PGECET Application Form. The students who will fail to do so will not be able to get admissions in the postgraduate courses. Steps to download TS PGECET Registration Number 2018. Then they have to click on the “TS PGECET Apply Online” Link. Now they have to fill all the information in the application form. Attach the scanned copy of documents, photograph and signature along with the application form. Next step is to pay the application fee. After successful payment, submit the form by clicking on the proceed button. Download the form and take a print of the generated form for future reference. For more than one test Extra Fees will be charged. Fees will be submitted through online banking modes. The aspirants must have passed BE/ B.Tech from any recognized college for admissions in M.Tech. For M.Pharmacy, they have completed their B.Pharmacy from any recognized institute. They have scored minimum 50% (45% for Reserved Categories) in their passing course. The aspirants must be a domicile of Andhra Pradesh/ Telangana. Aspirant Should have B.Pharmacy Degree recognized by Pharmacy Council of India. The students have to follow the topics from the books which they have studied in their Bachelor’s degree. The Telangana PGECET Syllabus Pdf will include all the material which is required for the exam and ME admissions. The syllabus will be made available on the official website soon. TS PGECET Syllabus will be provided in the form of PDF. We have provided here the direct link for the downloading of the exam syllabus. Pharmaceutical Analysis and Quality Assurance.